When I talk with women in the Passage, they often comment that they love necklaces, but can no longer bear much weight around the neck. Indeed, I have "evening" necklaces—it's not that they're formal, it's that they're so heavy I can't wear them for more than a few hours. And these days, "heavy" is what just "normal" used to be! I've featured the work of Kristin Giving, a true Beading Goddess, before. From the plumeria-scented air of Maui to the Arizona desert, she scouts for castoffs, using thrifted or found materials to make beautifully-composed pieces. She says, "Design is the main component of my creation—ever striving for better and better looks. 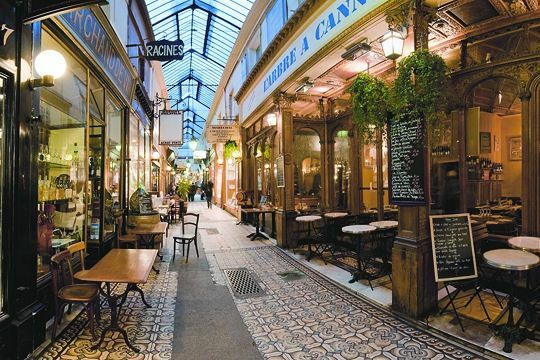 Of course, I like the workmanship to be as good as I can make it." 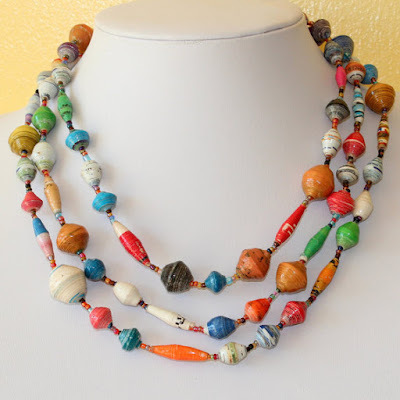 She usually works with semi-precious materials like coral, pearl and bone, and recently expanded her repertoire to paper beads, sharing the fun by teaching two young adult granddaughters. If they have inherited her eye, they'll be lucky young women! Her newest projects involve use of paper and fabric, still repurposing found or secondhand goods. I'd never have guessed the necklaces below were made with glossy tourist and artist brochures she picked up in Maui, strung on jute (left) and hemp (right) twine. 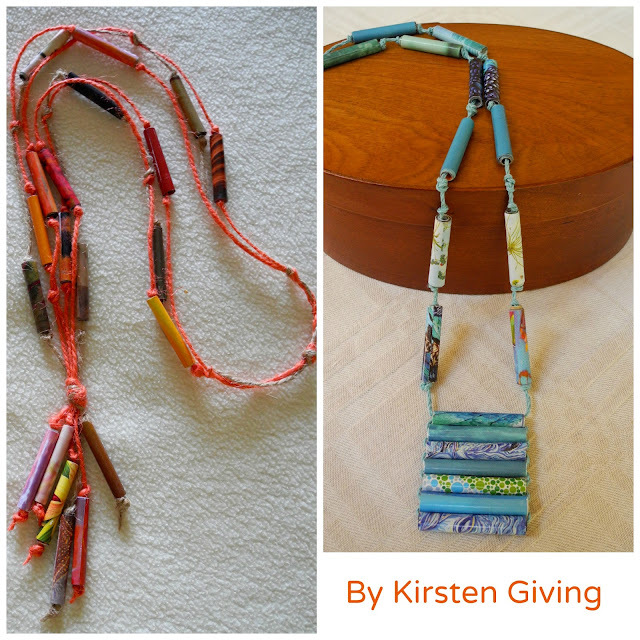 Kirsten sells some pieces at her local Assistance League thrift shop. I love the full circle: rescued from a thrift, transformed by her talent, and then, offered in another fundraising thrift! Since most readers can't get to the American Northwest to score her creations, we'll dress the windows today with artistic paper jewelry that's available online. 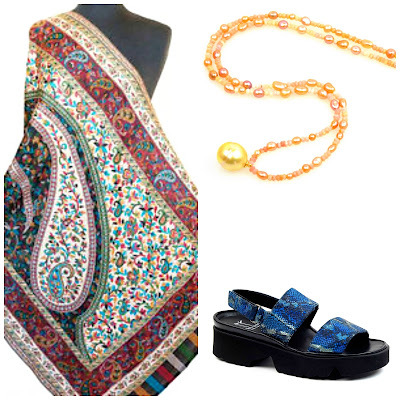 Several Ugandan projects employ women, and provide a much-needed income. When in the hands of skilled artisans, papier-mâché sheds it's school-project vibe. 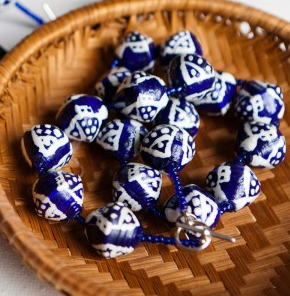 Fair-trade Ugandan paper-bead necklaces are perfect travel jewelry, or you could tuck one in your suitcase for your hostess. Price $10 each, from EkisaPaperBeads. Bead for Life is another organization of Ugandan paper bead artists; I especially liked the handpainted pieces. The striking blue and white "Imena" painted necklace is $51 via their web site. You have a black jacket, and need a striking piece to lift it out of basic-ness? 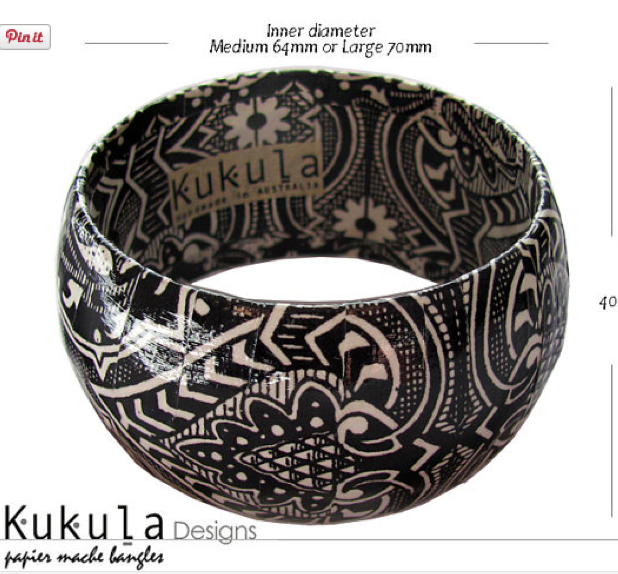 I suggest the graphic punch of a paper bangle from Kukula Designs in Australia, $18 via Etsy. Kukula's bold bangles are sealed and lacquered to withstand wear, but not in the shower. Papier maché can also make beads, and in the hands of an artist, you will find arresting designs like the 32-inch necklace by BoscoeBottega, of chunky beads hand-painted with coloured enamel; price, about $18. 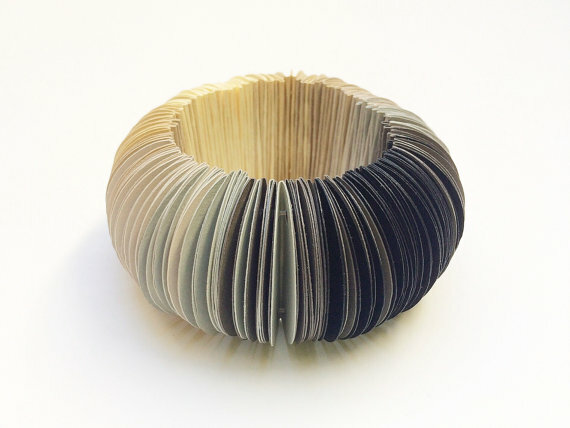 Here's another paper jewelry technique; I keep staring at the elegant degradée effect of... card stock. 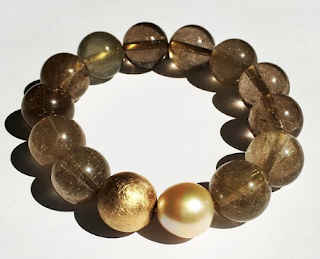 Bracelet by TheCreativeBee; price, $48. 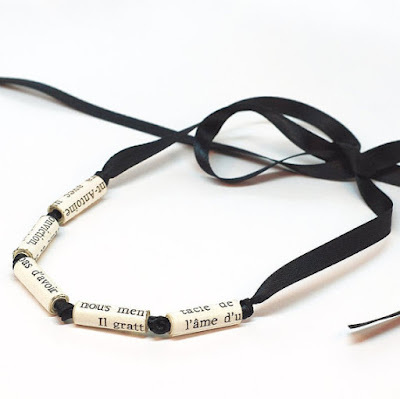 Tanith is a San Francisco-based artist whose paper bead creations are both sophisticated and unusual; you really must see all of them; but here is a French text made into beads, and finished with a satin ribbon; so pretty! Price, $30. 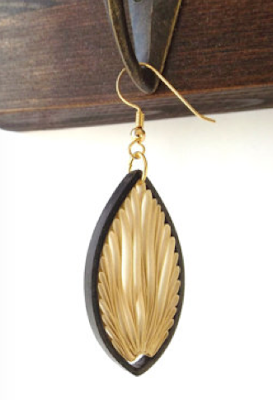 I can think of so many reasons to collect paper jewelry: lighthearted and lightweight, such pieces are perfect for travel, when precious metals don't make sense, and make unusual, lively casual-clothing accessories. Earrings and necklaces last a very long time, as long as you don't have a cat, as we once did, who loved paper beads literally to bits. Many thanks, once again to Kirsten, who scouts for castoff components and then makes exuberant creations for a good cause, or to delight her friends and family. 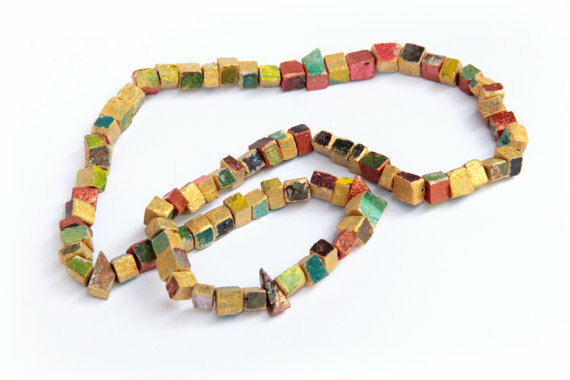 Our local Eileen Fisher store for a while was carrying some African paper bead necklaces, but not as striking as these. It's fascinating work and lovely artistry! There must be something in the air. I've had a lot of fun with a triple strand necklace made of either balsa or cork which is perfect for summer wear when I leave my scarves in the cupboard. Wanting more light weight pieces, I decided to try making my own, hence the bead workshop. And now, this wonderful post! So inspirational, thank you. Thank you so much for the wonderful compliment of showing my work on your blog. I apologize for this late response, but have been out of touch re online activity. The jewelry which I make, with joy and exuberance, is part of me--the creative touch I have strived to enhance all of my visual activities. I remember making little things from paper when young. (My dad worked at a publishing house and he always brought home scrap paper. In those early years, glue and tape was not very accessable and pricy so I made my own, with flour and water.) I remember cutting out layers of paper with little doors that opened. I also spent a great deal of time drawing house plans (I did want to become an architect!) Those early years were formative and perhaps now, many decades later, have come full circle, with my working with paper in various ways. Along the way, I fell in love with fabric and have enjoyed endless years of sewing and making things with fabric, including my new passion of fabric jewelry. One can follow one's passions, or not, and I am very happy that my jewelry making has been a highlight of my many hours available in retirement! I hope many of you will experiment with papers and fabrics. Laura H--best wishes for your working on beads! As I have only recently started making my own beads I can assure you that the results are really special and about as custom as can be had!